“Hillary Clinton and her campaign of 2008 started the birther controversy. I finished it,” Trump said in Washington, D.C., on Sept. 16. Neither of those things is true. As we have written before, there’s no evidence that Clinton or her campaign had anything to do with bogus claims that Obama wasn’t born in the United States and thus was ineligible to be president. What we do know, as we wrote in November 2008, is that some diehard Clinton supporters pushed that theory during that year’s presidential campaign. But again, there is no evidence that either Clinton herself or anyone on her campaign staff was involved in that. “We are never going to say anything about his background,” Penn wrote. Again, if there is evidence that Clinton or her campaign had something to do with the origins of the so-called birther movement, we’ve yet to see it. And Trump has never offered any proof. Trump is also wrong to say he “finished” what he called the “birther controversy.” The issue was long settled, as we wrote repeatedly, even before Trump prominently injected himself into the birther movement in April 2011, as he was mulling a presidential run. Back in 2008, the Obama campaign had made public the official birth certificate issued by the state of Hawaii. FactCheck.org staffers touched, examined and photographed that document, as we wrote in our “Born in the U.S.A.” article. Trump claimed in 2011 that the official “Certification of Live Birth” that Obama produced in 2008 was “not a birth certificate,” but we noted then that he was wrong. The U.S. Department of State uses “birth certificate” as a generic term to include the official Hawaii document, which satisfies legal requirements for proving citizenship and obtaining a passport. 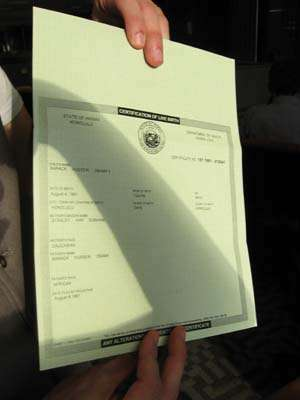 The Obama birth certificate, held by FactCheck.org writer Joe Miller in 2008. And there was more evidence than that. On April 27, 2011, just a few weeks after Trump began floating some of his bogus conspiracy theories about Obama’s birthplace, President Obama released the long-form version of his birth certificate. At the time, Obama said he sought release of the confidential long-form birth certificate from the Hawaii Department of Health so that the nation could focus on more serious matters. “We do not have time for this kind of silliness,” he said. So while Trump may have an argument that he played a role in getting Obama to release his long-form birth certificate, he’s wrong to say that he “finished” the debate. It was already finished, at least to our satisfaction. And if Trump had “finished it” by pressuring Obama to release a long-form birth certificate, at least one person was apparently unconvinced: Trump. We’re glad to hear that Trump is now convinced Obama was born in the U.S. But his claims about the issue continue to stray from the facts. There’s no evidence that either Clinton or anyone on her campaign staff “started it.” Nor did Trump “finish it.” If anything, Trump continued to perpetuate the issue long after it was settled.